August 9, 2010 - Park City, UT - Summary of Federally Mandated Record Retention Requirements Released - Janco Associates has just updated its federally mandated record retention requirements for employers. The list of requirements is available on its web sites www.e-janco.com and www.ejobdescription.com as a PDF document which can be printed. The CEO of Janco, Mr. Victor Janulaitis said, “We have decided to provide this document to everyone who needs it as a service to all employers. This set of requirements is part of Janco’s standard Record Classification, Management, Retention, and Destruction policy Template. A record is essentially any material that contains information about your company’s plans, results, policies or performance. In other words, anything about a company that can be represented with words or numbers can be considered a business record - and companies are now expected to retain and manage every one of those records, for several years or even permanently depending on the nature of the information. The need to manage potentially millions of records each year creates many new challenges for businesses, and especially for IT managers who must come up with rock-solid solutions to securely store and manage all this data. 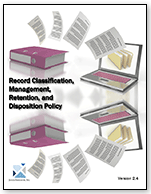 The Record Classification, Management, Retention, and Destruction policy, which is over 50 pages in length, is a detail template which can be utilized on day one to create a records management process. Included with the policy are forms for establishing the record management retention and destruction schedule and a full job description with responsibilities for the Manager Records Administration. It comes in MS WORD format and is easily modifiable. Included with the template is detail definition of record types and retention periods as well as citations for these requirements. IT organizations of all sizes contend with a growing data footprint with more data to manage, protect and preserve for longer periods of time. Online primary storage, has focus a on fast low latency, reliable access to data while near-line secondary storage has a focus on low cost and high capacity. Long-term data retention requires a combination of ultra-low cost, good performance during storage and retrieval, and reduced footprint in terms of power, cooling, floor-space and economics (PCFE) - also known as a small green footprint - for inactive data. The Backup and Backup Retention policy is an 11 page sample policy that is a complete policy which can be implemented immediately. The document is provided in MS WORD format and is easily modified. This policy is included in the Disaster Recovery / Business Continuity Template. Janco has combine the policies that it has developed over time with some of the best IT organizations around the globe into a single package. With this bundle you get a PDF file that has all of the procedures in a single document that is over 210 pages long. It would take your staff months to develop these procedures from scratch. In addition you get a separate MS-Word document for each procedure which can easily be modified.